In case you hadn’t yet heard, the 2016 Chevy Malibu is redesigned for next year. The new look has Malibu fans wondering why Chevy hasn’t done something of this magnitude before because the new Malibu looks great! The Red Line Series Concept looks even better, and was featured at the SEMA Auto Show in Las Vegas to show off its sleek new look. The Red Line Series Concept has got the Malibu looking better than ever. This particular model was featured in silver with some colored accents to really accentuate the new design. This car is certainly worth a look! Check out these five facts about the 2016 Chevy Malibu Red Line Series Concept. The redesign of the Chevy Malibu includes a larger vehicle that delivers on passenger room, especially in the rear. This 9th-generation vehicle has more accessories and technology available to surpass its competitors. On the Red Line Series Concept, a Thule rack was featured on the roof to give the impression that you can bring along anything you need for adventure on the new Malibu. The black bowtie emblem is very popular and is featured on the front and back, and it looks pretty sharp on the Red Line Series Malibu. It’s also got a spoiler, 19-inch wheels, and an available sports pedal kit. The 2016 Malibu even includes some features that were only reserved for luxury cars before. These include LED lighting, wireless phone charging, an 8-inch touchscreen, and leather seating along with ventilated seats. The ventilated seats are a first for the Malibu to offer while the other features will surely impress buyers. The Chevy has a ton of features of offer with its redesign for 2016! 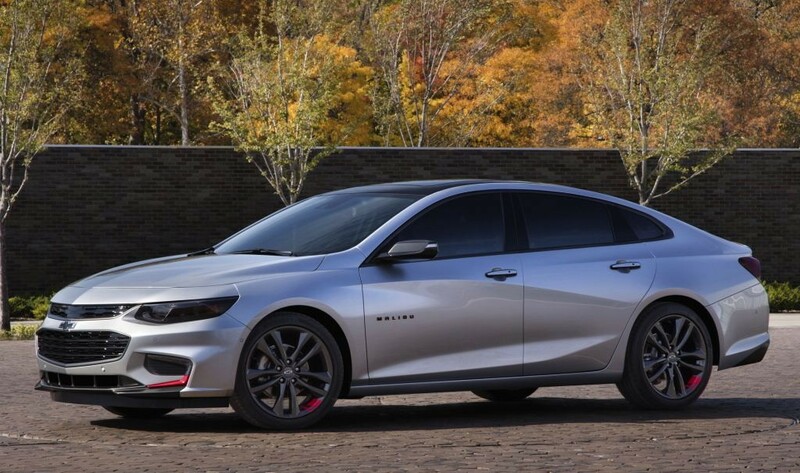 The 2016 Chevy Malibu Red Line Series Concept features red and black accents that pair noticeably well with the silver color that this car features. It includes red fog lamp bezels in addition to the black Chevy emblem on the front and rear as well as a modern grille that’s glossy black. This is further emphasized by the black mirror caps and the dark tint of the windows. The lights even appear to be tinted on this Malibu. Although this all looks really well on the silver color, we’re curious to see how it will look on the other colors the Malibu will feature. The visual appeal this car offers wasn’t overdone, which is important when you’re doing colors like red and black. The 2016 Malibu Red Line Series Concept has red accents on the wheels; however, they’re offered only on two spokes. This looks great if the wheels are parked in alignment, but when they’re thrown off, it does look a little unusual. Chevy may have chosen to feature the red color on only two spokes per wheel in order to not let the red color overwhelm viewers. The 2016 Malibu is actually 300 pounds lighter than its former models, which is a significant weight change when you consider the fact that the Malibu is actually larger. Chevy was able to increase the wheelbase by 3.6 inches to provide more interior room, precisely 1.3 inches more of legroom in the rear. Although we haven’t received any specifics on the drivetrain yet, it’s expected to have a decent horsepower number along with a potential Ecotec or maybe even a hybrid engine. This Malibu is expected to surpass its competition on fuel economy, getting a potential 45 MPG with the Hybrid system, which would be better than any of its midsize competitors when it comes to sedans. The lighter car combined with the better fuel mileage and additional room in the interior gives the Malibu the upper hand when it comes to the competition. Chevrolet has really stepped up its game when it comes to the 2016 Malibu. The Malibu Red Line Series Concept appeared to be a little more about looks than it was about performance. We’re hoping to see at the least a custom intake system in addition to a performance exhaust system. While the red and black accents certainly work well with the dark window tinting and silver color, potential performance upgrades is what we’re hoping for. The suspension lowering kit is welcome addition in order to make the Malibu sit lower to the ground without compromising on its height too much. The sports pedal kit is also a plus. It’s expected that the Chevy Malibu will have some decent horsepower along with its upgraded drivetrain. The Malibu has been severely underwhelming in years past, but not so for the 2016 Chevy Malibu, especially the Red Line Series Concept. Although the Malibu has four doors, it still has a very coupe-type feel and look. This is further accented by its sleek design, well-defined lines, and is longer and lower than its predecessors. The Malibu also has an updated roofline that slopes nicely. While this cuts out a bit of headroom inside, we think it’s worth it. The lighter design combined with the fuel mileage and sleek body look make the 2016 Malibu the best Malibu yet. It surely is one of the best-looking Malibus of all time! 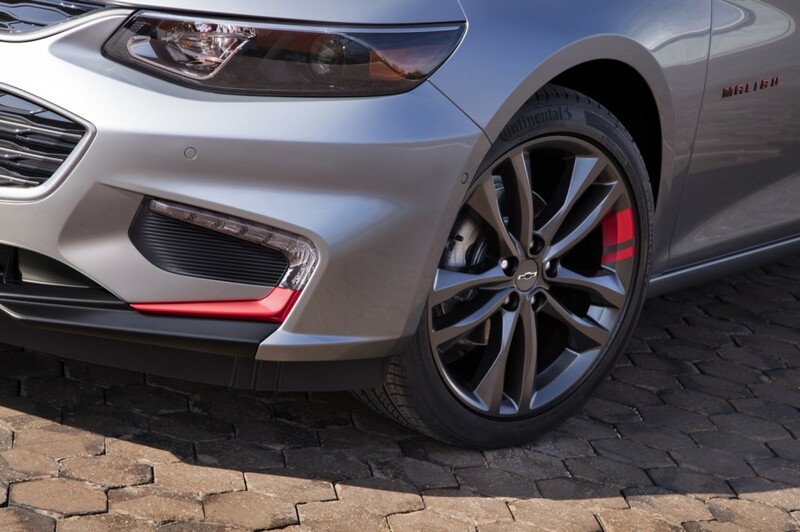 The 2016 Chevy Malibu Red Line Series has a lot to offer in the visual department. Its redesign impresses with tons of safety features as well as a new body design that wows. Although we’d like to see some more performance features on this vehicle, we’re looking forward to the increased fuel mileage and the cool red and black accents on the Red Line Series.